From my room to the world yeah! Tell me what should I do? What should I do? 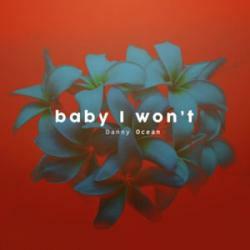 BABY I WON'T es una canción de Danny Ocean del año 2016. La letra ha sido escrita por CARLOS MANUEL ESCALONA CRUZ, DANIEL MORALES; publicada por Universal Music Publishing Group. Agradecemos a orianaferreiro por haber subido la letra.